The following posts written by Kelly Berry have been featured on the VIDA fitness blog, serving 15,000+ members. Aura Spa is a full-service spa tucked away inside the VIDA club at U Street, The Yards, Metropole, City Vista and Renaissance locations. While the spa is conveniently located within some of our busiest locations, visitors can expect to feel transported from the vibrant energy of the club and the city outside to a quiet and serene place. The spa conveys a softer side of VIDA with dim lighting, candles, aromatherapy, tranquil music, and detox water. It’s a place to unwind and recharge from the busy Washingtonian life. Lots of options, how to choose? One of the favorites for summer is the Detox Body Cocktail, which includes, 1) a microbead scrub to exfoliate, 2) a sea mask to replenish moisture into the skin, and 3) a body butter to seal in all that goodness! Layne recommends this treatment if you are looking to balance your skin and reverse some of the effects summer sweat and sun damage. All Aura services use Biotin products which are all natural and formulated for sensitive skin. The Detox Body Cocktail features a Baltic Sea mask that when heated naturally balances skin texture and adds moisture to areas that are in need of some H2O. The signature Swedish massage is great option if you are looking to improve circulation and focus on the relaxation aspect. Pressure is light to medium using long flowing strokes, and aromatherapy of your choice is also included in this treatment. What to expect & how to prepare? If it’s your first time to the spa, no special preparation is necessary, except for booking your appointment of course. One note of caution, if you sunburned yourself badly at the beach or the pool, wait until the burn has subsided before coming in, your body will thank you. Same goes for fractures or wounds. Let your body heal! Other things to keep in mind, have an open dialogue with your massage therapist. They do have magical powers but they’re not mind readers. Be clear with expectations when speaking to your massage therapist before the session. If you are experiencing tension or pain in a specific area say so! Clear communication will make sure that you get the most out of your session. Ready to book your appointment? Visit www.auraspa.net to make a reservation at either the U Street, Metropole, City Vista, The Yards or Renaissance locations. If you want to book an appointment with Layne Curry, you can find her at the U Street location, which also has a sauna and steam room directly connected to the spa. When not at the spa, you can find Layne teaching restorative and power flow yoga classes as several of the VIDA locations. Are you a fierce badass female? Do you support women empowering themselves to feel strong in their bodies and minds? Do you want to rock out to some killer beats? Do you want to channel your inner KNOCKOUT and POUND goddess? Do you like swag from brands like Athleta, Sephora, Bang Salon, Grape Intentions, Dry Bar and David Yurman? We thought so! Learn more about “Power to the She” below. The party kicks off with a 75 minute KNOCKOUT experience at 11:15am Sunday, July 23 at VIDA Verizon and morphs into a POUND-rockout (complete with Ripstix) to release your inner rockstar! Finally, the party closes with swag gifts to treat yourself for a fitness job well done. Amazing music you’ll be jamming out to! Space is limited, RSVP is highly encouraged. If we reach capacity waitlist will be in effect. 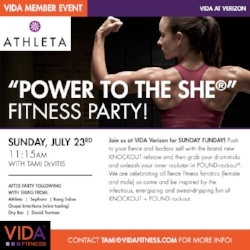 To RSVP for this Power to the She event please email tami@vidafitness.com. We sat down with VIDA yogi, Mario Austin to get his take on yoga and explain why more men should take up the practice. We’ve compiled the essential bits of knowledge for those thinking about starting a practice and ways to get more out of your next group session if you’re already part of the yoga community. 1. Yoga helps you build flexibility! So don’t worry that you’re not flexible when you begin. 2. No one is looking at you or judging you. They are too busy focusing on themselves. 3. Yoga is one of the best outlets to bring calmness and support mental health. 4. Want a workout that builds a killer core, strengthens biceps, triceps and increases hip mobility? Do yoga. “If you want to have a well rounded fitness program, yoga is it. Just from the foundational poses alone – plank is core! Chaturanga – there’s your ripped arms! When I first started practicing, I had to remind myself to go at my own pace, which sometimes means slowing things down. Often people think you have to keep up. However, sometimes only your body can tell you where you need to go. There’s also a lot of hip mobility involved in yoga, which for men is 100% needed. I love rigorous challenges in a practice everything from arm balances, core work, hip openers, but the important thing is to find a style and approach that works for you. VIDA offers so many styles and variety with our team of instructors, so there is definitely something for everyone,” says Mario. 5. Real Men Do Yoga. Find a brogi. We want to hear from our fellow VIDA male yogis! Connect with us on social and use the hashtag #VIDABrogi to be part of the conversation. Mario teaches regularly at VIDA Verizon and subs at all VIDA locations. You can find him on the schedule here.